Figure 1. Surgical landmarks for craniotomy. a. Mice are anesthetized intraperitoneally (i.p.) with cocktail combination of ketamine (100 mg/kg) and xylazine (5 mg/kg). b. Anesthetized mice are placed on an operating table with a heating pad maintained at 37°C and under a dissecting stereomicroscope. c. While adhering to aseptic surgical techniques, a 0.5 cm vertical skin incision is made midway between the lateral part of the orbit and the external auditory meatus (Fig. 1). d. The The rostral pole of the parotid gland and the upper part of the temporal muscle are pushed aside after partial resection to expose the cranium. e. A small craniotomy is then made with a 0.2-mm burr at the junction of the zygomatic arch and the squomosal bone, and above the anterior distal branch of the MCA, using a high-speed microdrill (Fig. 1). f. The sectioned layer of the skull is removed with fine forceps, and the dura and arachnoid layers are carefully opened to expose the brain superficial vasculature (Fig. 2). g. The right MCA distal to the lenticulostriate branches is localized using a stereomicroscope, and electrocauterized using a microcauterizer (Fig. 2). h. The coagulated MCA segment is then transected with Vannas scissors to verify that the occlusion is permanent. i. The muscle and soft tissue are replaced and the surgical site is closed with 6-0 sterile nylon sutures. j. 4% lidocaine cream is applied over the closed surgical site as a local anesthetic, administered 1 mL of physiologic 0.9% saline s.q. to prevent dehydration, and eyes coated with artificial tears to protect from drying. k. Mice are maintained at 37°C after surgery until fully recovered from anesthesia. l. Fully recovered mice are allowed free access to food and water in their cages for 24 h.
Figure 2. Schematic illustration and landmarks of the right middle cerebral artery (MCA) (Panels A and B). Outline of cerebral vasculature (Panel C). a. Twenty-four hours after surgery, the mice are euthanized by cervical dislocation. b. The brain is carefully dissected and removed en bloc from the calvarium and placed in a previously cooled matrix for sectioning. c. 1 mm coronal sections of the brain are made while contained within the matrix (Fig. 3, left panel). d. Brain slices are placed in 12 well plates, freed from the dura mater and vascular tissue, and then soaked in a solution of 2% TTC (2,3,5 -triphenyltetrazolium chloride) in 0.1 mol/L PBS (pH 7.4). e. Brain slices are incubated in a 37°C water bath for 10-30 min with gentle shaking to ensure even exposure of the surfaces to staining. f. Excess TTC is then drained and brain slices are refrigerated in 10% phosphate-buffered formalin. g. The sections are stored in this manner for up to seven days until the tissues are scanned for further analysis. Figure 3. Schematic layout of the brain and approximate 1 mm cortical slices (left panel). TTC-stained coronal section of the brain identifying infarct as unstained (white) necrotic area surrounded by stained (red) viable tissue (right panel). a. All image collection, processing and analysis are performed in a blind manner and under controlled environmental lighting. c. All sections in the 12 well plates are scanned simultaneously. The lid is closed and black felt covered the plate for greater contrast. d. The scanner settings to acquire the images are: 300 dots per inch (dpi), millions of colors, auto contrast off and no active adjustment. e. Acquisition of the image is done through Adobe Photoshop and with an Apple compatible scanner within the Adobe Photoshop Scanwizard plugin. f. The raw files are then saved as uncompressed TIFF files (tagged image file format), written onto a CD-R and further backed up onto a server. g. Images are then analyzed using image analysis software (i.e. SPOT). Magic Wand tool is used to autotrace the specific areas of interest. 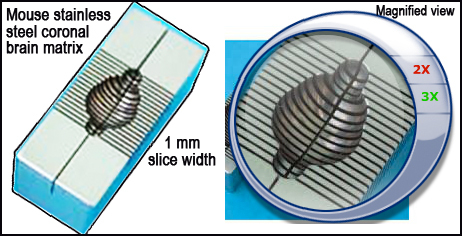 h. Infarct volumes are calculated by measuring infarct areas on the separate slices, multiplying areas by slice thickness, and summing all slices; this “indirect” morphometric method corrects for edematous swelling. Craniotomy: is a surgical procedure where in a piece of bone is temporarily removed from the cranium or skull providing access to the brain. Middle cerebral artery (MCA): is one of the major arteries supplying blood to the cerebrum. Infarct: refers to a lesion characterized by dead (necrotic) tissue caused by loss of blood supply and source of oxygen. Ischemia: is an obstruction in blood supply to tissues, resulting in shortage of oxygen and metabolic nutrients (i.e. glucose in the brain) essential for keeping tissue alive. Necrosis: change in brain morphology histologically observed as neurons undergoing irreversible degeneration manifested by nuclear changes and eventual disappearance and presence of "ghost" cells.